Youth basketball, as any sport, has its share of injuries. Some programs do a good job of providing injury information to and training their coaches about injury prevention and first aid, while others don't, so the purpose of this article is to discuss the most common injuries, focusing primarily on the ones suffered by kids in elementary school (grades 1 through 6), and mentioning middle school when appropriate just to highlight differences between the age groups from an injury standpoint. Although I am not a doctor, nor an athletic trainer, I do have many years of experience as a basketball player at every level, including the pros, and as a youth basketball coach, and it is from this perspective that I approach this subject. Fortunately, most injuries in youth basketball aren't more serious than bumps, bruises and bloody noses (what I call the "Three B's"). As a result, in terms of first-aid, youth basketball coaches (and the program administrator or league director) should make sure, first and foremost, that a supply of chemical ice packs is on hand to treat children who fall or bump into another child, or onto the court, while practicing and playing games. do make sure to have a towel or cloth on hand to provide a layer between the pack and the skin to avoid freezer burn. Elevate (make sure to elevate the injured arm or leg slightly to avoid swelling). To treat cuts, abrasions, and bloody noses, every youth sports coach should have a properly stocked first-aid kit on the bench; at the very least, they should have a few bandages, a pack of clean tissues to absorb any blood, some blood neutralizer (hydrogen peroxide is okay, sterilizing wipes, e.g. cavicide, are better, and soap and water are best), and some anti-bacterial gel (e.g. 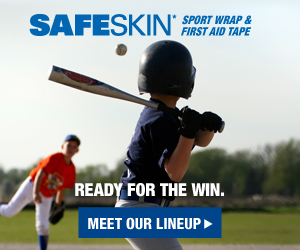 Neosporin®) on hand at every game or practice (again, all of these items should be in the coach's first aid kit). apply compression to the bridge/base of the nose and tilt the head forward (Note: contrary to conventional wisdom, tilting the head back for a nosebleed is a bad idea because it actually increases blood flow into the sinus cavity). As a side note, whether your child's program or league requires it or not, kids should not be let back into a game until the bleeding has been stopped, the wound has been covered (again, having a first-aid kit comes in handy), and that any blood on clothing has been neutralized or covered (a change of shorts or jersey would be preferable). More advanced first aid will obviously be required in the case of suspected fractures, or the event a child suffers sudden cardiac arrest (SCA), but such injuries are very rare at the youth level, and beyond the scope of this article or my expertise. SCA is treated in depth in MomsTeam's cardiac safety center. While less common than bumps, bruises or nosebleeds, sprains of the finger, knee and ankle do occasionally occur at the youth level. Check for a possible fracture. A simple way to do that is to ask the child how the finger feels when they squeeze your hand. If they tell you it hurts at all to squeeze, or if they wince in pain, they should not be allowed to return to play or practice that day, and the coach should suggest to their parent or guardian that the finger examined by a doctor right away. If a finger is simply sprained or strained, taping it gently to the next finger with a piece of cloth adhesive tape or adhesive strip or two (see how important it is to have a first-aid kit?) may allow a child to continue playing. Ankles: I very rarely seen sprained ankles in basketball players under the age of 11 or 12. The reason, as a doctor friend once told me, is because their ligaments and their muscular structure is such that they are built more like taffy before that age. In this age group, prolonged ankle pain (more than a week) should prompt a visit to the doctor to check for a fracture, as the bone is more likely to break than an ankle ligament to tear.Most kids these days wear high-top sneakers, which also reduces the chances for sprains. As a simple preventative measure, coaches should check to make sure that the players' shoe laces are properly tied, so they don't trip over their shoelaces or have the shoes fall off of their feet on the court. I am often asked whether basketball sneakers are different from regular, everyday sneakers for younger players. I don't really see much of a difference. Some basketball shoes close using Velcro straps across the tongue instead of shoe laces. Velcro straps actually require just as much attention as shoe laces, because children sometimes don't pay attention to the straps, so coaches in this case should make sure the shoes are strapped securely on the feet. The good news about today's shoes is that they provide so much more support than the shoes when I was a younger player, but that's all we had back then. Once players reach middle school, when their bodies start changing, they may benefit from wearing ankle braces, especially if they have had a sprained ankle before. The best predictor of a second sprained ankle, and this something I know very well from experience, having sprained my ankles a number of times, is having had a sprained ankle once before. Once a player reaches the age and level of play where players are doing a lot of jumping, especially in middle school, the risk of ankle sprains increases. The worst kind of ankle sprains occur when a player is coming out of a jump and lands on another player's foot and twists his/her ankle. Again I know based on a lot of my own hard experience. So that's why a lot of the trainers and doctors are now recommending braces, and you will begin to see these more when the children reach middle school. Knees: A discussion of more serious knee injuries, such as a torn anterior cruciate ligament, are beyond the scope of my expertise or this article, but, fortunately, are very uncommon at younger ages, so we'll stick to knee sprains. These are more likely when you get to middle school and these are statistically more of a risk for girls. But remember: a few girls and even some boys may get a growth spurt in 5th or 6th grade, so knee sprains are not out of the realm of possibility in elementary school-age basketball players. There has been a lot of research over the last 10 to 15 years on knees, especially the female knee. The focus has involved a lot of preventative education and training for both players and coaches. This involves opportunities for strengthening of the muscles around the knee, particularly the hamstrings and the thighs. With kids there can be an imbalance of strength between the front muscles of the leg and the back muscles that can increase the risk in some children. So this is where parents and coaches of late elementary and middle school-aged children, especially of girls (but it's not bad for boys either because their bodies are growing too) should be aware of possible muscle imbalances, and be prepared to do some muscle training to build leg strength. This can help make sure the knees can handle the child's increased weight, as well as the faster pace of the game as they grow, especially into middle school. In addition to greater speed, there is also the greater occurrence of jumping and landing as well as rapid stops and change of direction. So knees become very important to the game and more at risk and both age and level of play increases. When knee sprains do occur, then the severity of the injury is going to determine the amount of time that the child is going to be away from basketball and rehabilitating. But once he or she gets back into playing, there are several different types of braces that players can wear to help prevent re-injury. Knees are very important but, thankfully, knee injuries are less common than finger or ankle sprains. Watch out for head injuries! One of the things youth basketball coaches need to watch out for is possible head injuries. While rare at younger ages, even younger kids can bang their head on a floor or against another kid's head in basketball. Youth basketball coaches may be more inclined to downplay the risk of concussion, thinking they really only occur in sports such as football, soccer, hockey, lacrosse and baseball. But this not the case. In the case of a head bump, if the coach thinks it was anything other than very minor, he or she should always err on the side of caution, take the child out of the game and not allow him or her back in that day. Hopefully, the child's parent or another adult (in loco parentis) is at the gym, and I suggest asking that parent or other adult to be cautious and look for any typical signs of concussion once they have left the gym (remember that symptoms of a concussion may not show up until the next day or even later, so erring on the side of caution is important). If in doubt, it is best to get the child checked out by their doctor. In any situation where the injury looks at all more serious, treat it as an emergency and call 911. Better to have EMS come and have it be a false alarm then to let a serious problem go untreated. Since MomsTeam's Concussion Center contains the most comprehensive catalog of concussion articles and videos on the Web, if you are looking for concussion information, click here. A youth basketball coach should also know about proper hydration and be able to recognize the signs, and provide first aid in the event of, a heat illness, which is the most preventable of all youth sports injuries. Coaches need to know the importance of kids drinking plenty of fluids, not just on hot days, and not just when a gym isn't air conditioned. Again, hydration is a topic that MomsTeam's Hydration Safety center covers extensively, but it's a good idea for a coach to bring along some extra water bottles for kids who may forget to bring their own. Although most gyms will have a water cooler nearby, it doesn't hurt to have an extra bottle or two. All of this information, of course, will not do your child or the youth basketball program in which he participates, much good if it doesn't get into the hands of coaches charged with the responsibility of providing first aid in case of injury, knowing the signs and symptoms of concussion , and, in the rare event of a fracture or cardiac arrest, calling 911 for help, so I suggest that you print out this article and provide it to your child's coach or the league director so you can be sure they know at least the basics of first aid. When more serious injuries do occur, including concussions, fractures, and knee ligament injuries, a coach should not allow a player to return to practice or game play until they are sure that the child is okay. It is best to get a note clearing the return to play from the child's physician. Hopefully the local program or league has an administrative procedure for that, but even if that is not the case, the coach should insist on getting that note anyway. One final thing: make sure you tell the coach that he or she is responsible for your child's safety while in his/her care. Being cautious about possible injuries is far more important than winning the game.